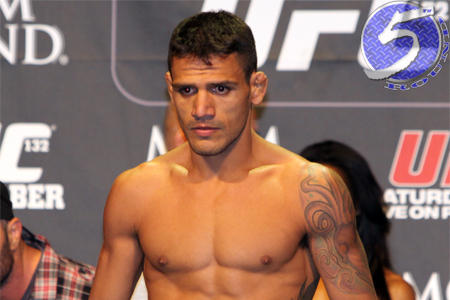 An undisclosed injury has forced Rustam Khabilov out his UFC 170 scrap against Rafael dos Anjos (pictured). Since dos Anjos is already locked and loaded, he had no qualms with accepting a tango with unbeaten Khabib Nurmagomedov instead. The new lightweight bout takes place at UFC on FOX 11. Amway Center in Orlando, Florida hosts the April 19 festivities. The UFC announced the switcheroo Tuesday night via Twitter. Dos Anjos will be riding a five-fight winning streak into the pivotal matchup. The Brazilian most recently posted a unanimous decision victory over Donald Cerrone in August. Nurmagomedov owns a perfect 21-0 professional record, with his past five tangos coming inside the Octagon. The 25-year-old was last seen in September posting a unanimous decision over Pat Healy. FOX broadcasts the main card live beginning at 8PM ET/5PM PT.